an Easter Sunday Tradition in Florence! 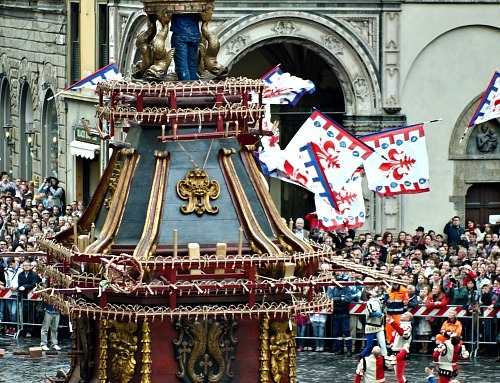 The Scoppio del Carro ('Explosion of the Cart') is one of the most anticipated appointments in the year. 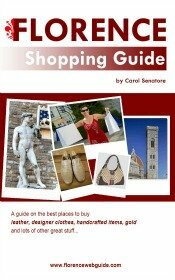 This traditional Florentine festivity that goes back to the 1400’s never fails to attract crowds, both Italian and foreign. 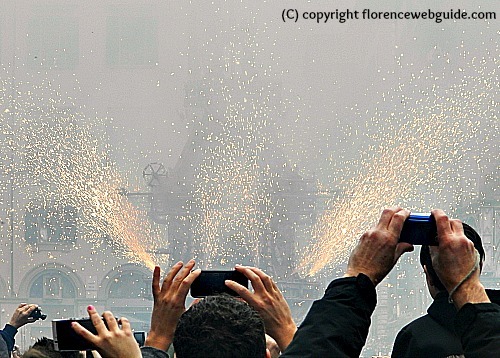 On the morning of Easter Sunday a carved wooden cart loaded with fireworks called ‘Brindellone’ leaves from via Il Prato. 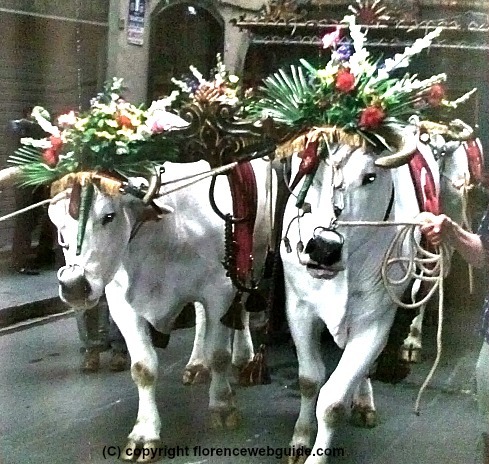 The cart is accompanied through the cobblestone streets of the city pulled by decorated white oxen adorned with flowers and garlands representing the city of Florence. This procession includes marchers from the Florentine republic dressed in period costumes. A marching band plays and the spectacular city flag throwers – the Sbandieratori – are also part of the performance. The procession reaches its destination in piazza Duomo in front of the cathedral. 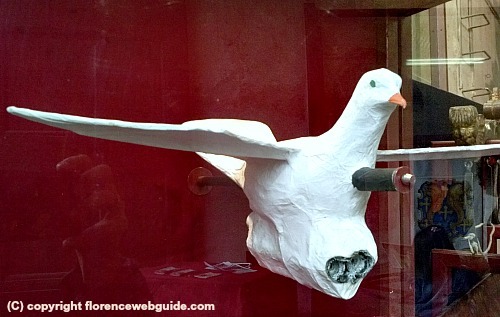 At 11 a.m. when, during the Easter Sunday mass, the Gloria is being sung, a mechanical dove (the traditional symbol of peace) leaves from the altar. The bird flies along a wire leading to the cart, which, once it strikes, sets off the pyrotechnic display of fireworks and whistling wheels arranged all around the antique carriage. The cart becomes buried in a sea of smoke with many coloured sparks flying through the air. For about 15 minutes you witness a kaleidescope display of fireworks and bursts of light until the cart is ‘spent’. Traditional lore states that If the dove, which flies off from the altar, reaches the cart without being obstructed, this auspices a plentiful harvest for the upcoming year. The Explosion of the Cart is an antique tradition that goes back to the first crusades. In the 11th century Muslims had taken over the Holy Land comprising the city of Jerusalem. Christians no longer had access to this Holy Land where Jesus had lived. In about 1100 an army of crusaders made up of Roman Catholic fighters and plain citizens set off for the crusades, an attempt to take back and re-open this land for themselves. The crusaders eventually re-captured the area. The legend goes that the first crusader to climb the wall of the city was Pazzio de’ Pazzi, a knight from Florence. Pazzi was honored for his bravery with a gift: three pieces of stone coming from the Holy Sepulchre (the tomb where Jesus had been buried). On Easter Eve (Holy Saturday) a fire was lit with these stones and each person given a bit of the fire, symbolizing purification. These stone splinters are still conserved in Florence today at the Church of Sant’Apostoli in piazza Limbo, a lovely Medieval/Romanesque church. 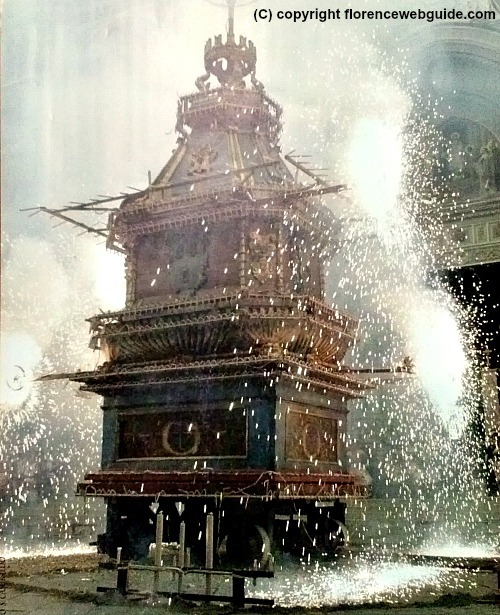 The origins of the Scoppio del Carro can be found in this fire and purification ceremony. As a religious tradition, each Easter, the stone slivers were used to start a fire which was distributed to the homes of the city by way of small torches. 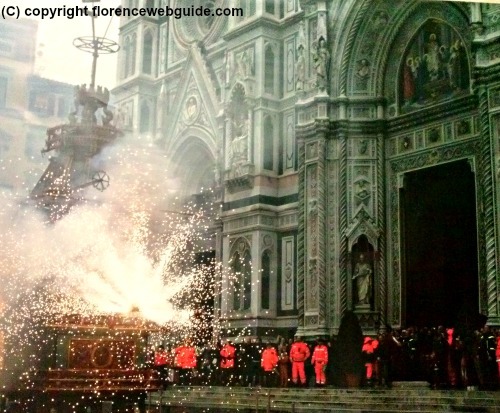 It was probably around the 14th century that this tradition was replaced by the use of a cart to bring the fire to the religious center of Florence, just outside the Duomo. Through the years the cart became more and more elaborate and the actual fire was replaced by fireworks set off by the dove of peace. The current cart of 3 tiers that you see today goes back to the 1600’s. 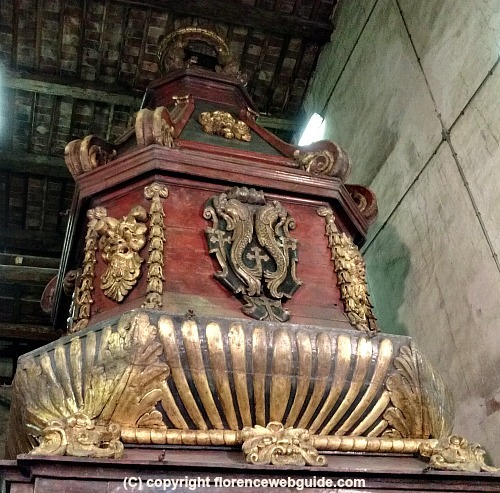 Due to this great honor awarded to the knight Pazzio de Pazzi, the Scoppio del Carro carriage is decorated with the coat of arms of the noble Pazzi family. Only during one brief interval during which the family had been disgraced and exiled from Florence was the Explosion of the Cart ceremony stopped. 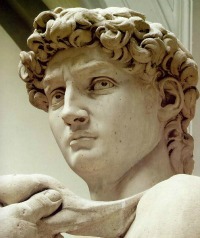 The Pazzi's were banished from Florence between the years of 1478 – 1494 due to their role in the assassination attempt on Lorenzo il Magnifico and his brother Giuliano de Medici, who was killed. The Florentines however, while agreeing with the banishment of the Pazzi for the heinous act against their rivals the Medici, missed their Easter fireworks festivities. In 1494 when the Medici were briefly banned from the city under Giacomo Savonarola, the Scoppio del Carro ceremony was brought back. 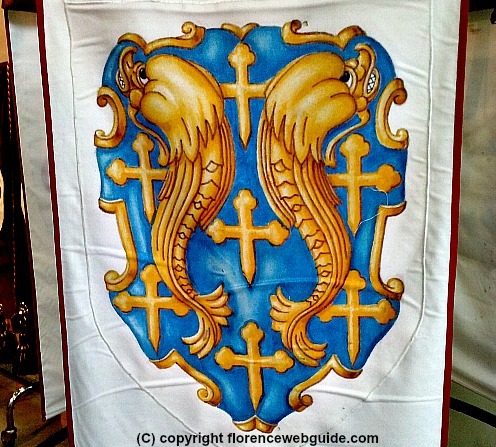 And so it is today, in the 21st century, that Florentines still love and look forward to this Easter Sunday event in Firenze. If you're fortunate enough to be in town on this day don't miss the Explosion of the Cart!